Install these lights in all facilities where pedestrians and forklifts mingle. They precede forklifts to warn pedestrians of approaching traffic, even at difficult intersections. Making fork trucks and other vehicles in your facility more noticeable and keeping workers warned of approaching traffic is critical to reducing the potential for catastrophic, sometimes lethal injury. 36% of serious forklift related injuries involve someone other than the driver. That is where the vehicle approach warning light helps prevent dangerous collisions. 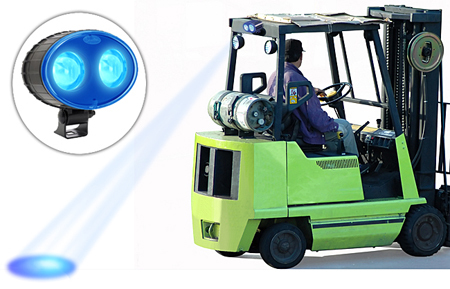 As the forklift or other vehicle travels, a bright blue light glides across the floor about 15 feet ahead of or behind it (depending on the mounting location), letting pedestrians know that a fork truck is approaching. 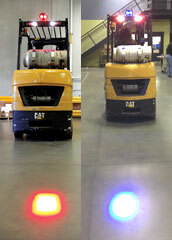 When workers are alerted by the bright light moving across the floor, they know a vehicle is on the way. Since the light moves only when the vehicle does, pedestrians can understand when the vehicle is stationary or on the move.